Described as “devastingly beautiful” (Gramophone Magazine) and “simply mind-blowing” (The Scotsman), Tenebrae is delighted to be performing its interpretation of Fauré’s Requiem with the exquisite Aurora Orchestra. Preceded by a selection of Bach’s chorales interspersed with his Partita in D minor, the performance will be presented in true Tenebrae style: set by candlelight and making full use of the performance space. Tenebrae will create an immersive audience experience in what promises to be an unmissable event in the choir’s inaugural Holy Week Festival. Join Nigel Short and Ian Ritchie for a pre-concert interview hosted by St John’s Smith Square’s Artistic Director, Richard Heason, at 18:30 in the concert hall. Please note this programme is 75 minutes without an interval. Tenebrae’s Holy Week Festival (9-15 April 2017), the first of its kind, aims to engage new audiences with performances of sacred choral music of the highest quality and explore the significance of Holy Week. 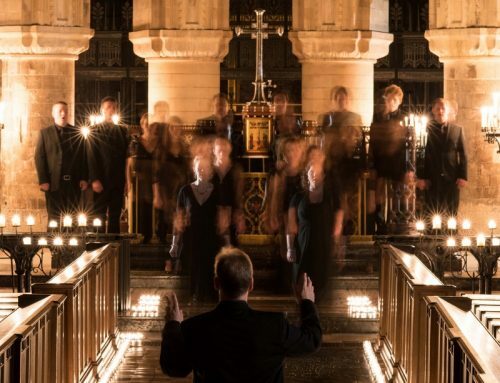 A donation will help Tenebrae and St John’s Smith Square reach out to new audiences, enabling us to introduce them to the arts as well as keeping the community events accessible for all, in particular, the late-night liturgical events which will remain free to attend. Donate online at www.easydonate.org/tene003 or to give £10 text TENE003 to 70191.